Before juicy opens another can of whoopass on me, here’s our long overdue overview of everyone’s favourite city centre hole-in-the-wall, Standing Sushi Bar (SSB) ! 2) I was looking forward to getting some exercise in. heh. Anyhow, I got a prerequisite standing shot for good measure! Let’s get down to the important stuff – the nosh! We’ve always been adventurous foodies and since the exhaustive menu board confused me a little, we decided to let Chef Roy do all the thinking by going omakase. The cute waitress advised that we set a $50 per head cap for a good taste of the delights that SSB bad to offer. It was quite a good deal as we were treated to a good mix of sashimi, other seafood delights from the sea around various parts of Japan, as well as interesting fried and grilled dishes. I must say that I was very pleased that we went for the omakase as we were able to experience little tapas-style dishes that we’ve never eaten before. Overall, our tastebuds were thrilled with the fresh ingredients and interesting mix of seasoning. However, when it came to the cooked dishes, there were instances where the chef was a little too heavy-handed with the seasoning. He explained that the shellfish for instance, were cooked in natural saltwater and as such the salinity levels were a little higher. I must say despite the fact that all the staff members spoke good English and were able to articulate themselves well (this is getting very rare with the influx of foreign service staff here in Singapore), they weren’t as proactive as we would have liked them to be. juicy’s green tea cup went dry far too many times and they were a little tardy when it came to getting us the bill and clearing our dishes. But hey, they got the job done eventually and that’s what matters! The Nett-Nett: Standing Sushi’s a good lunch/dinner option if you’re in the area and a fan of high quality Japanese food. personally, I would stick with the traditional sushi and sashimi – the less fuss the better. 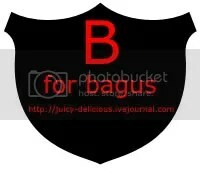 A resounding B for Bagus. We’ll be back!